In a large bowl, mix all ingredients together. In a wok or skillet, quickly stirfry the filling until the cabbage is just softened. Allow to cool. Place a teaspoon of filling in the middle of the wrapper Fold the wrapper in half to form a half moon shape, pinching the wrapper tightly together. Make sure no filling is peaking out or they will break while cooking. Steam or boil the dumplings (I like steamed best). Serve hot. Leftovers can be refrigerated and re-steamed the next day if need be. Excellent with my favorite dipping sauce. These are some tasty dumplings. The ginger, garlic and green onion add a lot of flavor that is nicely absorbed by the shiitake mushrooms. These are vegetarian (vegan, actually) dumplings but between the noodles, cabbages and the mushrooms they are pretty hardy and can almost sub as a meal. The half moon shape is the easiest dumpling shape to master but it is still quite attractive. You can get fanicier with the crimpling but when steamed, these dumplings are stars even simply prepared. 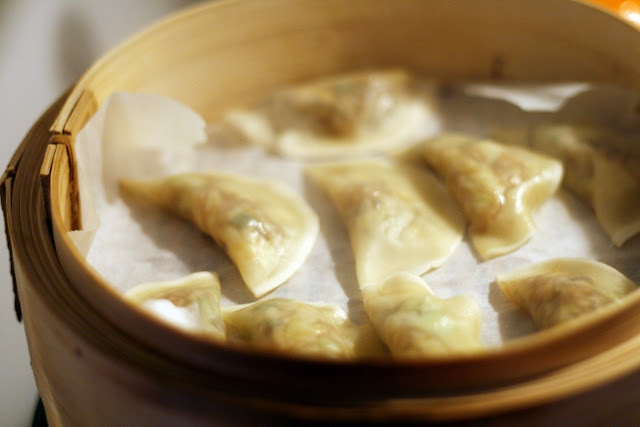 Half moon or crescent shaped dumplings are traditonal fare at Chinese New Year celebrations. While this filling isn't stictly traditional, it makes a good addition to the New Year's table. Other recipes suitable for Chinese New Year that have been featured on Coconut & Lime include Lion's Head, Longevity Noodles and garlic chive dumplings.